Michael Leland has been rifling through garbage bins, picking out recyclables, and pushing a shopping cart filled with the material down the street on the lower east side of Vancouver for more than a decade. “For years I just kind of pushed my cart through crowds with my head down,” he said. And much of the time, people ignored him too. “In a very broad sense people’s understanding of Binners isn’t good. 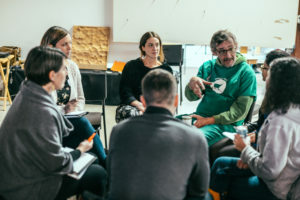 Many people put up their blinders [to Binners]” said Gabby Korcheva, Programs Manager with The Binners’ Project, a community-led initiative aimed at improving economic opportunities for and reducing stigmas of waste pickers. The blinder effect is, in large part, due to perceptions about discarded materials being dirty, valueless. Just as the materials are out of sight and out of mind, so are the people that sift through them. Leland speaking at a Binners’ Meeting. PC: Will Selviz. Leland, who is now 58, grew up in the fishing industry, hauling catch in for 25 years before he had a heart attack that forced him out of the business. Medical issues meant he had to fall back on disability checks and when it became clear he wasn’t going to be able to return to the water, he resorted to picking through dumpsters, in search of recyclables to trade in for cash. After years of binning, Leland knows the areas where he can earn a decent day’s wage. One of his best bets is outside of a yacht club where he can pull out enough recyclable material to earn $140 in a single day. For the average Binner though, a steady income is still no guarantee. Leland’s perceptions of his circumstances changed when he was introduced to The Binners’ Project in 2014. A Binner Event Team member servicing an event. PC: Robin Weidner. 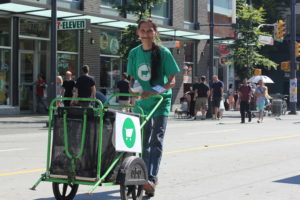 Among their initiatives is the Binners Event Program, connecting event organizers throughout Vancouver with Binners to work together on Zero-Waste logistics. Depending on the event, Binners can conduct recycling pickups, as well as public waste education and assistance for the event. 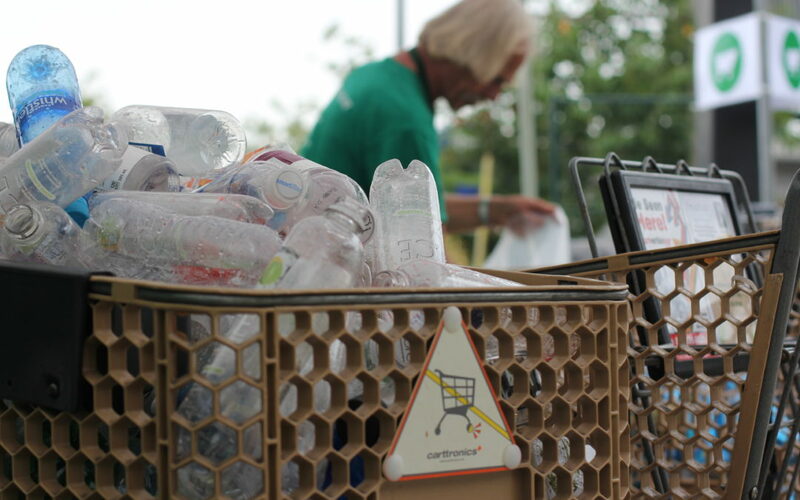 In addition to one-time event services, The Binners’ Project also connects with local offices and businesses with Binners in their area to set up weekly recycling pick-ups. These initiatives result in the diversion of literally tons of material that would otherwise go to the landfill, while offering an often disenfranchised profession an opportunity to earn a little extra cash to make ends meet. Recently Leland has come to terms with the longevity of his binning career. The change in perspective was especially apparent after he was featured in a video last year called “I Belong Here.” The film followed his binning journey, the struggles he has faced and, the successes of his work. “We are contributing a huge amount,” Leland said referring to the material that has been recycled by Binners. “Now I see this work does make a difference”.